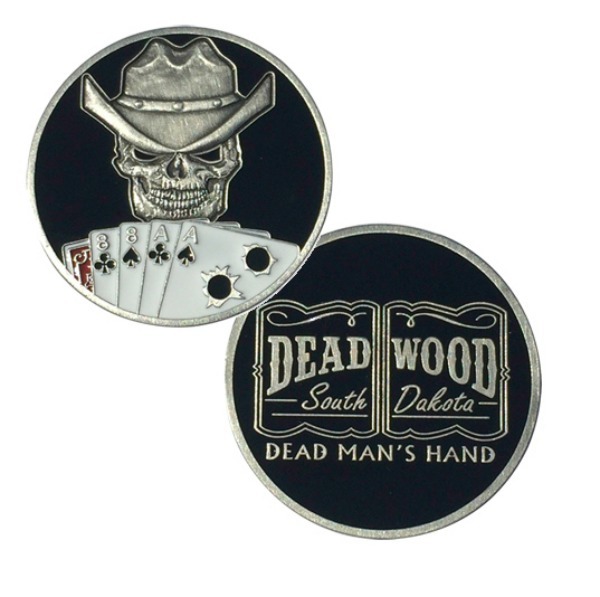 Designed and developed by MotorDog69 and minted in solid nickel with a baked enamel finish. The Dead Man's Hand is a two-pair poker hand, also known as "Aces & 8's". It gets its name from the legend of it being the five-card-draw hand held by Wild Bill Hickok at the time of his murder on August 2, 1876 in Deadwood, South Dakota. This coin fits in all 1.8" Medallion Plate Cover Challenge Coin Mounts. Click this Image to view the Medallion Plate Cover with this coin.